The gate control theory of pain proposed by Mel-zack and Wall in 19651 suggested that electrical activation of large diameter afferent fibers would have an inhibitory effect on the central transmission of small diameter afferent fibers, thereby blocking pain perception. 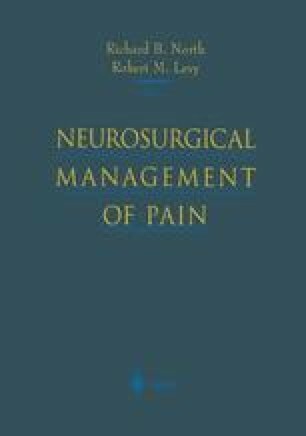 Wall and Sweet2 tested this hypothesis by observing that low threshold electrical stimulation of peripheral nerves via subcutaneous electrodes produced temporary pain relief in a group of five patients with posttraumatic neuralgias. This led Sweet3 in October 1965 to perform the first permanent implantation of a peripheral nerve electrode in an attempt to obtain long-term pain relief. Peripheral nerve stimulation (PNS) has been employed by numerous other investigators since that time, and it has become established as a valid treatment option in a small group of carefully selected patients.